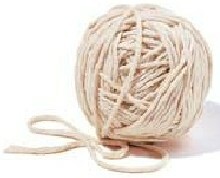 A man has admitted under cross-examination by the Unemployment Office, that he has nothing better to do than unravel string. Maurice Brooke, 56, made the astonishing revelation during a back-to-work interview at the office that has delayed his Universal Credit claim until he can prove he is actively seeking work. According to Brooke, he takes a piece of string, and systematically pulls it apart by nipping the individual lengths of twine and pulling them until they become separated from the main body. He then lays them on a piece of black velvet he acquired for this express purpose twenty years ago. He took up this strange hobby, as he had been unable to find employment, fully intending that it would be a temporary measure. That was in 1999. Initially, he found it hard to focus, but years of unravelling has had the desired effect, and he can unravel a ball of string the size of a tennis ball in less than a week. "There isn't much call for unravelling string these days, but if any employer is looking for someone to pull string apart, thread-by-thread, and to lay it neatly on a piece of black velvet cloth, I'm your man!"